Margot is my great aunt and was an early supporter of my work. 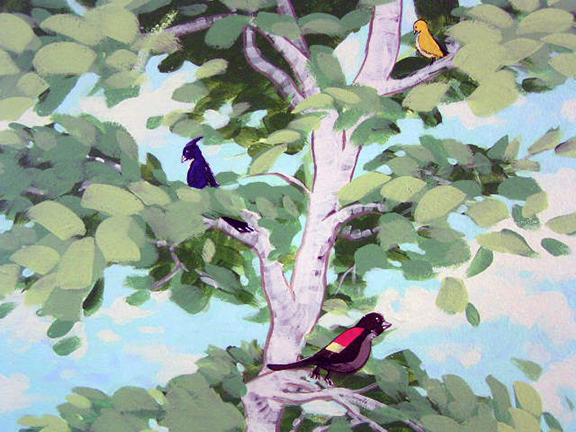 Shortly after graduating college, she commissioned me to paint a mural in her Long Island home. The goal of the painting was to bring light to the space and complement the library of books on the opposite wall. As a transition space from the kitchen and dining room to the living room, I thought a range of overt landscape shapes with fine details that complemented the flow of movement would be a good fit. Thus became Birdland, a tribute to Margot and all of the amazing people in her life. 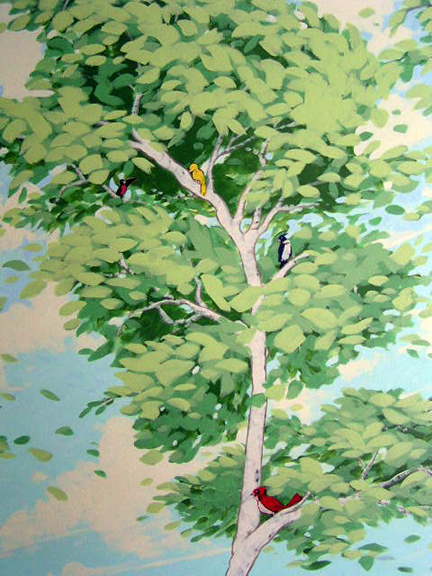 Since this was painted from scratch with only a loose concept sketch of the tree arrangement, the effects of the wind through the trees and chemistry between the birds was heavily inspired by the guests that summer. This was my first mural, and a true delight to create and share with Margot. Several years later, the house caught fire and the mural was destroyed.